If the headlights on your car are rubbish, it’s just a matter of time before you drive into something at night, unless you go everywhere at walking pace. What you need is to throw some more light on the situation, by fitting upgraded bulbs or extra lighting. There are several issues about being enlightened, including the legal side – seriously bright bulbs are banned because they’ll dazzle everyone else – while you could also overload your car’s electrical system if you overdo things. The easiest way of gaining more light is to slot in replacement bulbs, but make sure you buy from a reputable seller; there’s a lot of illegal stuff floating about, so don’t be surprised if you get caught out trying to buy cheap tat from some bloke on a market stall. The alternative is to fit extra lights, such as spot lights – again some stuff sold in the UK is illegal because it’s too bright. The key thing to remember is that the higher the power (wattage) rating, the more juice your car’s electrical system has to supply. Ask for too much and it might just blow a fuse – or worse. Fitting extra lights is easy enough – if you know what you’re doing. Avoid relays or allow wires to chafe then short out, and you’re guaranteed trouble. Screw up badly and your car could easily end up going up in smoke – so think very carefully before trying to do any work yourself. What would you do if your car broke down? Even if you’re handy with the spanners you might not have the tools or parts to fix it. All you need to do is leave the interior light on overnight or suffer a component failure and you’re on your own. Unless you take out breakdown cover beforehand. Breakdown cover is effectively an insurance, so you’re paying out for something you may never need. But like any insurance, when you do need the cover, you’ll be so glad you took it out. And unlike car insurance, everyone pays the same fee. Even better, if you live with your parents and they’ve got breakdown cover, you can probably be included on their policy for little or no extra cash. Run out of fuel, call out a garage to help, and you’ll pay £60-£100 plus the cost of the fuel. Suffer a flat battery and you can kiss goodbye to £60-£100 while relaying your car 150 miles will lighten your wallet by hundreds of pounds, depending on who does it and what time of day it needs to be done. There are loads of companies offering breakdown cover, offering a whole range of products, from basic roadside assistance to a full-on package that’ll provide a courtesy car or hotel accommodation should your car throw a wobbly – prices range from £30 to £150 or more. For roadside assistance and recovery, expect to pay around £60. To look at what packages are available, check out comparenow.com. Don’t take out breakdown recovery as an alternative to maintaining your car though; fail to service it and trouble is guaranteed. Take out personal cover and it means that you can call for assistance whatever car you’re in. Stick with ordinary cover, and only your car is covered in the event of a breakdown. Even the most basic of city cars comes with remote central locking nowadays, and it’s easy to just assume that when you press that button your car is safely locked. Not necessarily though; there’s a new scam in town, with thieves using remote controls for garage doors or gates to block the signal from your remote key. All they do is hold their button down while you press yours, and your signal is blocked. So the next time you press the button and walk away, it might just be worth trying the door handle to see if it really has locked, or you might come back to find your car has been ransacked. Also, because of standard-fit immobilisers, stealing a modern car often involves the use of the original keys – and the majority of these thefts involves the keys being stolen directly from the owner or their home. Never leave your car keys visible in your hallway, where they can be seen through the letterbox. Don’t leave your keys in the ignition when buying petrol, opening the boot or popping into a shop. Never hang up your jacket in a public place with your keys in it. Be wary of using a locker at the gym; they’re a prime target for car key thieves. In the winter, don’t leave an engine running to clear the windscreen; cars are often nicked as a result. Drive with your doors locked, to reduce the risk of being car-jacked – especially in slow moving traffic or urban driving. Carry your keys securely; don’t allow them to be dropped or to fall through a trouser pocket. Even if you don’t have kids yourself, you may have to transport a friend’s at some point – and you’ll never carry a more precious cargo than somebody’s child. It’s reckoned that at any one time in the UK, around two-thirds of child seats are fitted incorrectly. It’s also reckoned that one in six child seats are acquired second-hand, with around one in 20 having been involved in a car crash at some point. Once a child seat has been involved in a crash, it should be recycled; even a minor bump can result in the seat being damaged beyond repair. Don’t buy a used one. Buy the right seat for your child’s weight and physical development . Check the seat has an ‘E’ mark, proving it’s officially approved. Replace the seat accordingly as the child grows. Before every journey, check that the seat is securely fixed. Make sure the harness is firm. You should only be able to get one or two fingers between the strap and the child’s chest. Never modify a child car seat in any way. Child car seats must not be used in side-facing seats. Generally, children must use the correct car seat for their weight (rather than age or height) until they reach 135cm tall or 12 years old (whichever comes first). The driver of the vehicle is legally responsible to ensure that all passengers under the age of 14 are wearing their seatbelts and using the appropriate seat or child restraint. If you’re caught failing to ensure that a child passenger is not using an appropriate child restraint, you face a fine of up to £500. If a child is exempt on medical grounds, they need to use a seatbelt or child restraint specifically designed for their needs. A minibus with an unladen weight of under 2.54 tonnes, although children aged three and above must use one if available. If there isn’t one available, children aged three or above must use an adult seatbelt if it’s fitted instead. Children younger than three can travel without a seatbelt, but only in the rear seats. If there’s no room for three child seats in the back, a child over the age of three can sit in the back using an adult belt, or in the front with the correct child seat. A child under the age of three cannot travel unless they sit in the front with the correct child restraints. Adjustable car seats: offered by some manufacturers, they’re designed to be adapted as a child grows. Be sure that you are using the appropriate setup for your child's weight by following the instructions or checking the label. Integral child seats: fitted to some recent cars on the production line. If it’s EU-approved, no additional child restraint is needed, as long as the child is of the correct weight (check the label or car handbook for confirmation). If the integral seat isn’t EU-approved, a child seat will still need to be used in its place. The seatbelt feeds through the holes in the child restraint without obstructions (applicable only for seats secured using an adult seatbelt). There’s enough space for your child to stretch their legs. There’s minimal sideways or forward movement of the seat. Only the seatbelt - not the buckle - is touching the car seat (applicable only for seats secured using an adult seatbelt). Any rear-facing child car seats are not in front of an active airbag. There’s nothing between the bottom of the child restraint and the actual car seat. The adult seatbelt fits properly across your child when the seat is fitted; it can’t sit under the child's arm, too close to their neck, and isn't twisted or too loose (applicable only for seats secured using an adult seatbelt). Most cars made since 2002 are fitted with universal ISOFIX fixtures. This makes securely fitting compatible car seats quick and simple, as you can easily attach the seat at the two or three mounting points. Most vehicles have two ISOFIX points at the base of the seat, but some are also fitted with a third - at the top - for additional security. A child car seat can be used in the front seat of a vehicle provided that it fits properly. It is important to remember that before fitting a rear-facing baby seat, any frontal airbags in your vehicle must be deactivated. The majority of children's car seats can only be used with a belt that has a diagonal strap and a lap belt (a three point belt). However, if you have an EU-approved child restraint that’s compatible with a lap belt, this is permitted by law. If your vehicle doesn't have seatbelts (for example, it's a classic car), a child over the age of three years old can travel in the back without their car seat. Children under three must not travel at all in cars, vans or goods vehicles without a seatbelt or appropriate child restraint. You'll have noticed that all sorts of motoring costs are dictated nowadays by how much CO2 (carbon dioxide) a car produces. Road tax is the obvious one, but if you buy a new car you'll also have to pay an additional levy that's based on CO2 emissions; in some cases even your parking charges can be based on how much CO2 your car emits. And if you venture into London's Congestion Charging zone you'll be exempt from paying only if your car emits less than 100g/km of CO2. So what are CO2 emissions all about, and why the focus on them? It's simple really; there's an assumption that the planet is overheating because of humans ramping up the amount of CO2 in the atmosphere. So in a bid to get us all into more efficient cars, we're now being taxed according to how much CO2 our cars emit. If you're still struggling to see the connection, it's a simple one; when fuel is burned, carbon dioxide is produced, and the more fuel an engine burns, the greater its CO2 emissions. So buy a car with a smaller engine (which burns less fuel) and your CO2 emissions will be reduced. The alternative to buying a car with a smaller engine is to go for one with diesel power instead of petrol. A diesel engine works in an inherently different way from a petrol unit, which is why they're noisier and have very different driving characteristics. One of the characteristics of diesel engines is that they emit soot particles, which hang in the air and lead to breathing difficulties – and cancer. Suddenly the diesel engine isn't looking so attractive, is it? However, a diesel car's exhaust emissions can be cleaned up, to get rid of these particles, which is where the diesel particulate filter comes in. The DPF traps the soot then burns it off at very high temperatures, to help improve air quality. The problem for low-mileage drivers is that a DPF needs to get up to temperature to work properly, which means regular high-speed runs. Without these the filter gets clogged up with soot particles and it can lead to major issues and costs; replacing a failed DPF can easily cost over £1000. While this is good for your pocket, it’s not much good for the environment, which is why from Fenruary 2014 your car would fail the MoT on its exhaust emissions, if it came out of the factory with a DPF, which has since been removed. So if you’re buying a second-hand diesel-powered car that was made after September 2009, make sure it’ll pass an MoT. It’s never been easier to take your car to mainland Europe – as long as the French aren’t on strike of course. Which they usually are. Still, if you strike it lucky, you can have a great adventure without having to pay a fortune. The thing that puts most people off going to Europe – apart from not being able to speak the language – is knowing the rules of the road. Leave any speed camera locators at home, as they’re illegal in parts of Europe. Get caught with one and it’ll be confiscated and you’ll be fined too. Pack a warning triangle, fluorescent jackets, first aid kit, fire extinguisher and some spare bulbs – all of which are worth carrying anyway. You should also fit headlamp deflectors so you don’t dazzle oncoming traffic, and a GB plate for the back of your car is essential too. Buy the most detailed atlas you can – or if you use a sat-nav, make sure its maps are up to date. Getting lost in the streets of Hamburg or Paris isn’t much fun, if you can’t find your way out. Carry identification with you as you may be asked for it, if stopped by the police. Never leave it in the car though; take it with you at all times. Carry out basic car maintenance before you go. For example, make sure your oil and water are topped up and your tyres have enough tread. Blood alcohol levels are generally stricter than in the UK (0.5mg/ml rather than 0.8mg/ml in the UK. If you're driving, don't drink. Contact your breakdown cover provider to get your policy extended to cover you whilst abroad. Nobody wants to spend more money than they have to – whether it’s on music, booze or transport. While we can’t give you any tips on slashing your booze or music bills (well, we could, but…), we can offer a few pointers on how to cut your motoring costs. Here’s a stack of ways to reduce your motoring costs; some will be practical and others won’t. Pick and choose between them and see which ones you can adopt; add them all together and you could trim your annual motoring budget by hundreds of pounds. Depreciation is one of your biggest running costs; buy a new car and in the first year its value will plummet. Because it’s a hidden cost (at least until you come to sell the car), it’s often overlooked. Don’t fall into the same trap; do the sums before buying new. Diesel cars cost more than petrol ones to buy, so don’t pay a hefty premium for a diesel supermini if you cover just few miles each year. A petrol-powered small car will be economical and as a result it’ll take forever to recoup the extra cash you’ve laid out. If you’re buying the car on finance, shop around to get the best deal. Websites such as moneysupermarket.com and moneyexpert.com allow you to compare all the deals available, to make sure you’re getting the best one. Don’t buy a used car too readily; check it out thoroughly to avoid costly hassle in the future. Check out our full guide on how to buy a used car. If you’re selling your car, pitch its asking price at the right level. Too high and the phone won’t ring; too low and you’ll be out of pocket. Look at autotrader.co.uk to see what other cars like yours are going for. Keeping your car properly serviced doesn’t have to cost a fortune – especially if you do at least the basics yourself. Why pay somebody £50 an hour or more just to change a light bulb or top up the radiator? They’re very simple jobs that you can do yourself; if you’re not convinced, buy a Haynes manual for less than £20 and start saving with the first task. See haynes.co.uk for more. Unless you’re fairly committed, you won’t be able to do a lot of the jobs on your car so you’ll need to call in the professionals. You don’t have to go to a franchised dealer though; use an independent garage recommended by friends, as the bills will be lower. If your car needs new parts, you don’t have to opt for genuine items in the manufacturer’s box. Pattern parts are usually just as good, often made by the same company that makes the official bits, and almost always the cost is much lower. As you can read in our insurance section, saving a packet on cover is possible, just by shopping around. Don’t lie to get cover though, and don’t insure your car in your mum’s name because it’s dishonest and illegal. Drive more economically (check out our tips on eco driving). Cars are horribly complex objects, made up of thousands of components and dozens of different systems, which all have to work with each other for tens of thousands of miles. Sometimes things don’t go to plan and bits wear prematurely or stop working together, and that can often be safety critical. When things get to this point the car maker will usually issue a recall to put things right; all of the cars affected will be inspected and modified, so the whole thing doesn’t go up in smoke. The work is done by an official dealer for the manufacturer in question, and it'll be done at the manuafcturer's expense, so it won't cost you anything at all. Most models of car are recalled at some point or other; over time, some can be subject to several recalls while others may not need any at all. The manufacturer will do its best to trace owners, but some slip through the net; if you’re in doubt about your own car, you can see what recalls it’s been subject to by checking out the Vehicle Inspectorate website. If you think your car may need recall work doing, contact your local dealer and ask them; their records should tell you whether or not any necessary work has been done. Around 15% of cars fail an MoT – that’s one in seven – because of problems with one or more lights. One car in 15 has at least one brake light not working; one in 20 has no stop lights at all. Around 26,000 accidents a year are caused by misjudging another person’s speed, often a result of failing to spot another driver slowing down rapidly. A further 350+ accidents are caused by drivers not displaying lights at night or in poor visibility. A simple two-minute check once a week – just to see if all your lights are working correctly – could save you major grief and hassle, plus the prospect of injuries. Being rear-ended just because your brake lights aren’t working is a very real prospect. It’s not just about keeping your lights working – you must use them properly too. Switch on your headlights as soon as the natural light starts to fade; that’s when you’re most likely to disappear into the background. More than ever, drivers are focusing on their car’s fuel consumption, in a bid to save money. It’s no wonder; squeezing an extra few miles out of each gallon can make a big difference to a car’s running costs. How you drive a car makes a big difference to what sort of fuel consumption you get from it, but for many, the assumption is that it should be easy enough to achieve the official fuel consumption figures. The problem is, those figures are achieved on a rolling road in a laboratory, under test conditions – and to say they don’t reflect the real world is a massive understatement. Known as the New European Driving Cycle (NEDC), these fuel economy tests are made up of two parts. The first requires a car to be accelerated from a standing start to 43mph in 45 seconds, then settling down to a short cruise, with the car averaging 39mph. This is meant to simulate the extra-urban (out of town) driving that you do. Next comes the urban test, which sees the car accelerated to 10mph, then 20mph, then 30mph, in its lowest three gears. Fair enough you may say – but a whopping 195 seconds (more than three minutes!) is taken to do this. The procedure is repeated another three times, with idling time allowed between each one. So if you accelerate more slowly than a pedal cyclist and sit at 39mph on the open road, you can expect to achieve the official fuel consumption figures quoted by the manufacturer of your car - although the drivers you inconvenience on every trip will probably catch up with you and bludgeon you to death fairly soon. Meanwhile, for those of us in the real world, we’ll never get even close to what’s claimed. As if the tests aren’t unrealistic enough, car makers are also tuning their cars to do well in these specific laboratory cycles, ensuring those on-paper figures are even further removed from reality. And to make things even worse, with the tests all performed on a rolling road, there’s no wind resistance to take into account – unlike when you’re steaming along the M40 at 70mph. Because all new cars have to go through these tests, at least you can make direct comparisons between the various models you’re considering. But bigger cars tend to be able to get closer to the official figures than city cars and superminis – so if you’re buying a Mercedes S-Class rather than a Fiat 500 (for example), you may be less disappointed by the fuel economy you can achieve. Although if you’re loaded enough to buy an S-Class, you’ll probably be too minted to care. * Want to drive more economically? Then check out our guide to eco driving. It's reckoned that at least 150,000 drivers put the wrong fuel in their car each year – that’s one every three and a half minutes. Things have been getting worse in recent years because of the growth in diesel car sales – modern diesels are so quiet it's easy to forget you're driving one. If you put the wrong fuel in your car, don't turn on the ignition or start the engine as this will circulate the contaminated fuel and increase the risk of damage. The further the contaminated petrol goes in the system, the more expensive the repair – it can be cheaper in more extreme cases to fit a new engine, which is why repair bills can run into thousands of pounds. Sometimes the fuel pump works as soon as the ignition is switched on, circulating the contaminated fuel – so don’t even switch the ignition system on. If you put the wrong kind of fuel into an engine, a small amount of contamination shouldn’t cause lasting damage if caught early. The key is to top the tank up with the right kind of fuel before starting the engine. If you've put more than 10% (5 litres in a 50 litre tank) of the incorrect fuel into a tank, you’ll need to drain the tank and refill with the correct fuel, but if you've added less than 10%, top up with the right fuel and run normally. If in doubt, and you really do need to err on the side of caution here, or you could wreck your car's engine, get the car recovered to a garage for a professional inspection. For much more information on what to do if you put the wrong fuel in your car, take a look at the comprehensive article on the Auto Fuel Fix website. Your registration document, or V5C, is a record of your car and its owners. 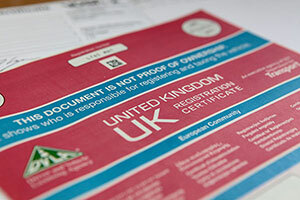 All of the information on it is what’s held on the national database at the Driver and Vehicle Licensing Agency (DVLA). The V5C is one of the most important documents when buying or selling a car, but it logs only who is the registered keeper – and they may be different from the legal owner. When buying a car, the registered keeper should be the person you’re buying from, and the VIN, or chassis number, should be the same as the one on the car. Also check the V5C’s watermark to see that it’s genuine and that it hasn’t been tampered with. Since October 2002 it’s been illegal to sell a car without a valid V5C, so don’t ever accept an excuse that it’s been lost as you can apply for a replacement easily enough. You’ll also need the V5C to tax your car over the counter at the Post Office, and if you need to replace your number, maybe because they’re damaged, you’ll need the V5C for that too. For more on registration documents, check out the DirectGov website. The brakes in your car work hydraulically, which means that when you press that middle pedal (assuming you've got a manual-gearbox car...), some fluid is pushed through various hoses and pipes, so that at each corner of the car a brake is applied. Your brake fluid is topped up via the master cylinder, which sits on the driver's side of the engine bay, below the windscreen. Most modern cars have a sensor which tells you that the level is low; your car shouldn’t get through brake fluid as such, but as the brakes wear, the level will drop a bit so you might have to top it up very occasionally. However, if you're constantly having to top it up there's a problem – one that needs investigating urgently. Most cars are built in such a way that the brake fluid never needs to be topped up, and because the sensor is always happy that the system is functioning correctly, you just carry on driving, oblivious. But danger lurks ahead if this sounds like you, because every couple of years or so, your car's brake fluid needs to be replaced. Brake fluid is what's called hygroscopic, which means that it absorbs water from the atmosphere. Over time, your brake fluid becomes more and more dilute, which reduces its effectiveness. Not only does it compress more easily (which means you get a spongy pedal), but it also lowers the boiling point of the fluid. If you use your brakes a lot, the result of all this is that you could end up with the brake fluid boiling – so you potentially lose your stopping power altogether. It's possible to replace your car’s brake fluid on a DIY basis and the materials on their own are just a few pounds. But unless you really know what you're doing we'd suggest you enlist the help of a qualified mechanic, because if you get things wrong, you could end up losing your brakes altogether. You should expect to pay £50-100 to have the work done. Any mention of car maintenance probably has you thinking of a bloke in overalls, up to his elbows in grease, with a fag in his mouth. But keeping your car in good condition isn’t just about taking it to some grease monkey and spending money – you can keep on top of the basics yourself. Just by spending a few minutes every week taking a look at key areas of your car, you could dramatically reduce the chances of being involved in a crash, while you could also save a stack of cash. Keeping on top of things can prevent them developing into something more serious; allow a whine or rattle to grow into a full-scale breakage and you could end up having to fork out some serious bread. If you’re put off making basic checks because you’ve seen the huge tool chests in your local garage, don’t assume you need to have the same sort of kit just to keep on top of the basics. Without any tools at all you can make sure your car is basically in fine fettle. All these key areas to check are ones that need a visual inspection, and a few minutes having a quick squint regularly could save you money – or even your life. Duff batteries are a real pain in winter; the engine’s oil is cold so the starter motor has a much harder job of getting everything going. Poor battery connections can make the difference between getting started and having to wait for the AA. Any damage to your car’s paint or bodywork will only get worse if left, ultimately leading to big repair bills. The paint does a lot more than give your car a pretty colour; it also protects the metal from the elements. Once this skin gets damaged, corrosion creeps in and leads to major rot – so get damage repaired immediately. Here’s something you shouldn’t be topping up; if you are, there’s a leak and that’s bad news because your brakes could fail altogether. There’s probably a warning light on the dash for a low fluid level, but check the reservoir weekly so you’re alerted before it reaches a critical point. Your car’s cooling system is sealed, so it should never need topping up. If it does, there’s probably a leak somewhere or even worse, the gasket between the top and bottom halves of the engine has failed (the head gasket). This can be costly to fix, but don’t just keep topping up the coolant or you could end up wrecking the engine. If you do have to top up the coolant, don’t just add neat water; if there isn’t enough anti-freeze in the system, the engine could be wrecked if it’s left outside in a hard frost overnight. Listen for any blowing from the exhaust, signifying that it could be about to fall apart. Once it does that, not only will things get seriously noisy, but there’s a good chance the feds will pull you over for causing a nuisance. Before it gets to the point where it’s blowing, take a quick look at the main pipe that runs the length of the underside of the car, looking for corrosion that could lead to holes. Your lights aren’t just for you to see at night; they’re also for you to be seen. If they’re not clean, not only will output be reduced, but other drivers may not see you. Also check the lenses aren’t damaged; cracks can develop into holes, leading to bigger problems. Drive without enough oil in your engine and there’s a good chance it’ll have a seizure – and so will you when you have to get it fixed. If the engine is using a lot of oil, check for leaks (puddles under the car) or blue smoke from the exhaust which means the engine is worn out. Your car may not have power steering, but if it does, you’l notice it when the assistance disappears if the fluid drains from the system! Apart from looking for signs of fluid underneath the car, check the power steering reservoir; if the level is getting low, there’s probably a leak somewhere – and that’ll need investigating. If your tyres aren’t correctly inflated, it can upset the car’s handling as well as leading to increased fuel consumption. Punctures are also more likely and as if all this isn’t enough, drive with the wrong amount of air in your tyres and they’ll wear out prematurely. You have to have at least 1.6mm of tread across three-quarters of the width of your tyres and all the way round – but you should aim to have at least 2mm across the whole width. Once the wear limit approaches, you could end up slithering all over the place once the roads get wet, so check the rubber hasn’t worn down to the wear indicators built into the tread pattern. If you haven’t changed your wiper blades for yonks, they’re overdue for renewal; they should be replaced every couple of years because of the rubber disintegrating. The old ones should just snap out and the new ones snap in; let the rubbr fall apart and you could end up scraping your windscreen with the wiper arm, which may result in a new screen being needed. Also, don’t forget to keep your washer fluid bottle topped up; there’s often loads of spray around and you could end up draining the bottle in double-quick time if you sit in fast-movingtraffic a lot. The windscreen is now a part of the MoT, so if there are any cracks or chips in it, you could end up having to get it replaced in a hurry the next time the car is tested. If you act in time, a chip can often be repaired so a fresh screen isn’t needed; leave things and it’s just a question of time before it becomes a major job. If you do need a new screen, you should be able to claim on your car’s insurance to have the work done, without it affecting your no-claims bonus. You just know that if you get a puncture, it’ll be at the most inconvenient time, when you’re in a mad rush to get somewhere. The last thing you’ll want to have to do is hang around, waiting for somebody to come to your rescue – which is why you need to get to grips with doing the job yourself. It’s also worth carrying some hand wipes or rubber gloves, plus a bin bag to carry the damaged wheel and tyre in your boot. Keeping the owner’s manual in the car could also be useful, and we’d recommend carrying a hazard warning triangle too. Park your vehicle on level ground as far away from traffic as possible, and if you’ve got a hazard warning triangle, place it 20-30 feet behind your car. If it's dark, ensure you’re wearing a high-vis jacket and using a torch. If near traffic, turn on your hazard lights. Any passengers should also get out of the car, and any heavy luggage will need to be removed. Remove the wheel cover or centre cap (if fitted), to gain access to the wheel nuts, and give each one a couple of turns with your wheel wrench, to loosen them. Then place your jack under the jacking point nearest the wheel - these points vary from vehicle to vehicle and will be indicated in your owner's manual, so it's important to know where they are ahead of time. Failure to place the jack properly can cause damage to the car and may provide an unstable lift. Turn the jack handle clockwise until you’ve raised the wheel completely off the ground. Remove the wheel nuts and remove the tyre. Fit the replacement wheel and tighten all the wheel nuts with your fingers. We've assumed there are five wheelnuts, but if there are just four, ignore nut number 5 as shown here. To ensure perfect alignment, you should tighten the nuts further (but not fully) in the following order either clockwise or anti-clockwise: first, third, fifth, second, fourth (if drawn out, the order looks like a five pointed star, as shown to the left). Lower the car by turning the jack handle anti-clockwise until the wheel is resting on the ground and the jack can be removed. Give those nuts a last turn (using the same pattern above) to ensure everything is secure, and make sure you pack everything back into the boot.